Blog | XMG Media | Global Specialists in Pizza Box Advertising and Coupons | XMG Media is set up to help media buyers, ad agencies and direct clients globally – providing a one stop shop as our specialty is pizza box advertising and coupons worldwide. 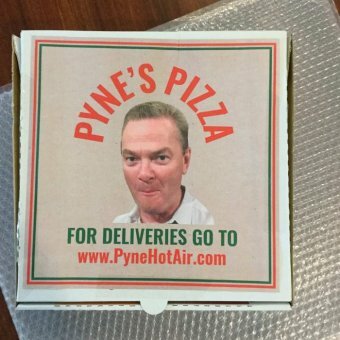 We encourage marketing strategies such as social media, online strategies and guerrilla marketing blending pizza box advertising into a balanced marketing mix of traditional advertising. As the pizza delivery giant says, “Bad roads shouldn’t happen to good pizza.” Which is one reason why it asks people to nominate spots where roads need paving, then shows up to fill potholes and pave streets, often spraying its logo over the finished work. The push is set to continue into 2019. The brands teamed up for a contest offering a year’s supply of two key life hacks for the time-pressed: Dove dry shampoo and Dunkin’ coffee. An odd, yet somewhat satisfying coupling for sleepy mornings. The chain substituted a “B” for the “P” in the IHOP moniker on social media and on the signage at one Los Angeles restaurant to get people thinking about its burgers, and not just its pancakes. A print ad for Ikea’s Sundvik crib included technology that also made it a pregnancy test. If peeing on the paper came out positive, the price of the crib dropped significantly to reflect the new price available with an Ikea Family discount. A limited run of labels on Johnnie Walker Black Label bottles were printed not with the “striding man” logo, around since 1908, but with Jane Walker, a female version made for Women’s History Month. The brand came out with miniature turntables that play Oreo cookies: Take a bite, put the “record” back and a different tune plays. The gift idea has caught on, even appearing in a Lifetime Christmas movie. The National Library of Australia (NLA) is urgently seeking 2016 federal election campaign material from Australian voters. The institution collects and preserves election ephemera to provide insights for anyone interested in the history of Australia’s democracy. But the material is often hard to access and the library relies on public donations to achieve their ambitious and politically-impartial target. “We want to collect something from every candidate and every party and every lobby group across Australia,” the library’s ephemera officer Catherine Aldersey said. “We worry that if we don’t capture this material at the time it will disappear or be recycled and we won’t be able to go back and fill in any of those gaps in the collection. 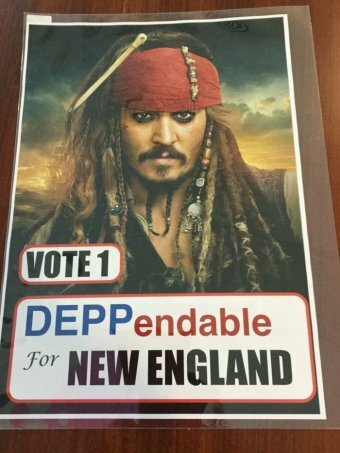 Ms Aldersey has urged Northern Territory, Western Australian and Tasmanian voters in particular to post the library any surviving printed election material, including items like how-to-vote cards, pamphlets, posters, signs, badges and T-shirts. “If anyone has got any campaign material around from Solomon, Lingiari or over in Western Australia we would love to have it,” she said. Ms Aldersey said she had even had difficulty securing one of the most common campaign images observed on Canberra verges. “At the top of my wishlist is one of those hard corflute posters of Malcolm Turnbull our Prime Minister,” she said. Movie night is becoming even more effortless, thanks to the Blockbuster Box from Pizza Hut and Ogilvy & Mather Group Hong Kong. The innovative packaging idea brings together a timeless combination — pizza and movies — in a whole new way: by turning a typical pie box into a film projector. 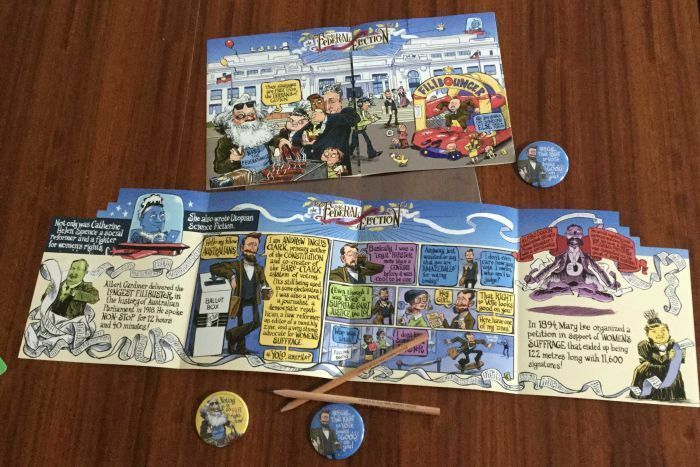 The campaign debuted in Hong Kong on April 17 and features a pizza container with a special lens housed in the “pizza saver” disc that sits in the middle of the pie. Pie eaters place the lens on the side of the box and are then able to project short films through their mobile phone via a special app. The project generated buzz from gadget enthusiasts, marketers and, of course, pizza lovers. After the success of an April pilot in Hong Kong, Pizza Hut tested the Blockbuster Box in two additional Asian markets. Reed Collins, chief creative officer for Ogilvy & Mather Hong Kong, said the client brief for the promotion was simple: Bring innovation to life in a way that would catch consumers’ attention and get them talking. One way to do that was through packaging. Aside from the added movie projector function, the agency worked with illustrators to create designs that reflected various genres — action, romance, sci-fi and horror. At the same time, the team needed to make the box as simple as possible to avoid adding to the production cost. They streamlined the design by assigning parts multiple uses. For instance, the pizza saver not only housed the projector lens, it also served as a stand for a phone. Another big challenge was designing the lens holder so that it snugly fit into the front of the box. After six prototypes, a solution emerged: a version that used raised “fins” that dug into the cardboard. The pizza saver housed the lens and served as a phone stand. While the box is designed to work with an app, pizza eaters can also use it to project other content from their phones: Consumers just have to lock their screen settings so video plays upside down, because the projector lens flips the content projected through it. David Mackenzie Ogilvy has been called the Father of Advertising and the greatest copyrwriter of all time. Born in West Horsley, England, on June 23, 1911. He was educated at Fettes College in Edinburgh and at Christ Church, Oxford (although he didn’t graduate). After Oxford, Ogilvy went to Paris, where he worked in the kitchen of the Hotel Majestic. He learned discipline, management – and when to move on: “If I stayed at the Majestic I would have faced years of slave wages, fiendish pressure, and perpetual exhaustion.” He returned to England to sell cooking stoves, door-to-door. 1. Never stop testing, and your advertising will never stop improving. 2. Never use tricky or irrelevant headlines… People read too fast to figure out what you are trying to say. 3. On the average, five times as many people read the headline as read the body copy. When you have written your headline, you have spent eighty cents out of your dollar. 4. A good advertisement is one which sells the product without drawing attention to itself. 5. There is no need for advertisements to look like advertisements. If you make them look like editorial pages, you will attract about 50 per cent more readers. 6. If you ever have the good fortune to create a great advertising campaign, you will soon see another agency steal it. This is irritating, but don’t let it worry you; nobody has ever built a brand by imitating somebody else’s advertising. 7. The more informative your advertising, the more persuasive it will be. 8. Every advertisement should be thought of as a contribution to the complex symbol which is the brand image. 9. Do not address your readers as though they were gathered together in a stadium. When people read your copy, they are alone. Pretend you are writing to each of them a letter on behalf of your client. 10. Our business is infested with idiots who try to impress by using pretentious jargon. Audi of America unleashed a wave of advertising efforts for its entry-level, sub-$30,000 A3 model that hit the United States April 3. The multichannel “Paid My Dues” campaign revolved around a television spot featuring comedian Ricky Gervais and various other celebrities. Four other spots trailed the lead commercial and conveyed ideas such as resilience and authenticity and built upon the buzz that began with the Super Bowl. The central commercial in the campaign is called “Dues” and displays celebrities going about their work routines while saying the lyrics to Queen’s “We Are the Champions.” The toil and grit that the song evokes likely resonated with the target audience, who may have felt that they had earned a new car. Department store chain Barneys New York aligned itself with the fight for transgender equality with an ad campaign and outreach. 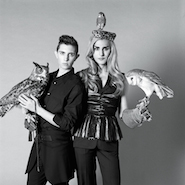 Barneys’ “Brothers, Sisters, Sons and Daughters” campaign featured 17 transgender individuals with diverse backgrounds and stories that were told through a series of short films. With this campaign, Barneys showed a more personal, human side to its brand that allowed it to connect on a deeper level with consumers. Photographer Bruce Weber shot the campaign that showed the 17 subjects, most surrounded by their loved ones. Mr. Weber also filmed interviews with the campaign stars and created a series of short films. Transgendered individuals featured include the first transgender student to graduate from her Oklahoma high school and an aspiring fashion journalist who was the subject of a nine-year documentary. Switzerland’s Baume & Mercier promoted an identity as a watchmaker that celebrates life moments with a new advertising campaign. The watchmaker’s first effort since 2011 aimed to keep Baume & Mercier relevant in the eyes of today’s affluent consumers without tarnishing its DNA by staying true to its mantra of “Life is about moments.” Instead of reinventing itself, Baume & Mercier relied on timeless imagery that was understood across generations. 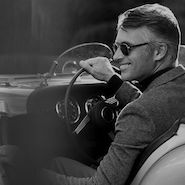 Photographed by famed German photographer Peter Lindbergh, the Baume & Mercier campaign featured its most iconic watches, the Clifton, Linea and Capeland. Each photograph was meant to show the ideal occasion for gifting, or self-gifting, a Baume & Mercier wrist watch. For example, the photographs depicted a wedding, a birthday, a birth and self-achievement. French fashion house Chanel premiered a new film campaign with model Gisele Bündchen under the direction of Baz Luhrmann for its storied Chanel N°5 fragrance. “The One That I Want” is a film that embodies the modern woman, the woman who makes her own decisions and struggles to balance her priorities in daily life. By regenerating the Chanel N°5 campaign, Chanel was able to reimagine the fragrance for the next generation of the modern woman. The film shows Ms. Bündchen as the song “You’re the Only One That I Want” plays in the background. Chanel’s campaign has run as a social video, television spot and in print advertising, breaking late in the year. Italian fashion label Dolce & Gabbana created an enchanted forest scene for its winter 2015 advertising campaign, taking its family theme into royal territory. In addition to print ads, Dolce & Gabbana shared the filming of the campaign with a video to more thoroughly depict the concept. This video takes the consumer further into the world Dolce & Gabbana created, making for a more immersive brand experience than a print ad. The video cuts between different sections of the forest, first showing a blond female model wearing a hood that looks like armor, then switching between groups of men, some dressed as soldiers, and some sporting crowns lounging on thrones. The royals drink and eat, stop to smell the literal roses or bicker about oranges. French leather goods maker Hermès brought its spring print campaign to life through a social video that explored the brand’s range of products. Hermès’ Metamorphosis print effort featured models in its ready-to-wear and accessory pieces set within a thick jungle of palm fronds and large leaves, while the digital campaign focused on an expansion of items such as jewelry and home wares. The Metamorphosis print campaign was seen in leading publications such as WSJ. magazine, Robb Report, Vanity Fair and Tatler. Depending on the publication, the ad showed either women’s or men’s apparel or accessories. 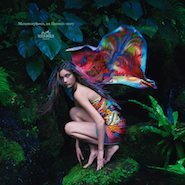 For instance, one image showed a woman crouched on a moss-covered stone wrapped in an Hermès scarf that was fluttering above her as if it were a butterfly’s wings. 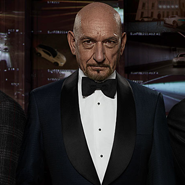 British automaker Jaguar gradually built its British Villains campaign leading up to the Super Bowl premiere, but the campaign had the legs to run with variation for much longer than the one-time mega-event. The brand enlisted British actors Sir Ben Kingsley, Mark Strong and Tom Hiddleston to front the “It’s Good to be Bad” campaign, all of whom had played villainous characters in at least one blockbuster movie. In the television spot, the actors mused on what makes British actors so attractive for villainous role. Following the campaign’s debut during the Super Bowl, Jaguar targeted New York subway commuters with train takeover promotions for its Good to be Bad campaign. LVMH-owned Parisian label Kenzo teamed up with art publication Toilet Paper magazine on a surreal advertising campaign for its fall/winter 2014 collection. The resulting campaign showed models popping up out of holes in the floor or breaking into houses using the dog door. Breaking away from traditional fashion advertising images can help a brand stand out in the middle of a magazine’s pages. Kenzo’s ad campaign took place in a slightly off-kilter world, where “the strange and beautiful coexist in singular harmony.” The campaign was released throughout the week of July 7-11 on Kenzo’s blog Kenzine, as well as on its Facebook, Twitter and Instagram accounts. French fashion house Lanvin highlighted its own familial bond with the winter 2014 advertising campaign, which stars model Edie Campbell and her relatives. In different campaign images, Ms. Campbell sits on her horse, and her family poses in evening attire. To introduce the campaign, Lanvin filmed a three-minute video of the family members interacting with each other through a stand-alone door. This floating house door acted as a playful metaphor for the maison, which was founded by a woman dedicated to making clothes for her daughter. Selecting a real-life family, from young adults to grandparents, allowed the brand to show its appeal and age appropriateness across generations of consumers. France’s Louis Vuitton reinterpreted the house’s codes and visual imagery under the direction of Nicolas Ghesquirère for his first advertisement campaign as creative director. Clothing in the print effort, fittingly titled “Series 1,” showed off Mr. Ghesquière’s fall/winter 2014-2015 collection. After the departure of former creative director Marc Jacobs, the first to develop ready-to-wear for the leather goods maker, many wondered what approach Mr. Ghesquière would take for both his designs and ad campaigns. Mr. Ghesquière recruited three iconic photographers to interpret his designs. Making appearances in fashion publications worldwide starting in August, the campaign featured the work of Annie Leibovitz, Juergen Teller and Bruce Weber, all of whom chose a different model muse and setting. The ABC has increased the amount it spends on advertising by 40 per cent as its total marketing budget swells to more than $11 million. The national broadcaster – which criticised government funding cuts in its annual report – spent $2.76 million on advertising in the 12 months to June 30, up from $1.98 million the year before. The spending comes as the ABC steps up self-promotion on social media and invests in other mobile and online services in an effort to make its content more relevant to a modern audience. The tactic has paid off. The ABC News Facebook page is the second fastest growing of any Australian media organisation, with 882,687 ‘fans’. Media buyers have attributed the broadcaster’s rapid growth on Facebook to paid advertising, since Facebook has changed its algorithm to stop organisations cluttering users’ personal pages with promotional messages. The increase in advertising spend comes as the broadcaster seeks to rein in expenditure in other areas, after the federal government cut its overall budget earlier this year. “The Board was disappointed that, contrary to pre-election statements made by the Prime Minister, the 2014–15 Budget, handed down in May, included a 1 per cent reduction in the corporation’s base funding,” the board noted in the broadcaster’s annual report. The ABC’s spending on market research and promotion, which includes advertising, rose 16.6 per cent to $11.63 million in the 12 months to June 30. Its promotion spend increased 15.7 per cent to $3.3 million. 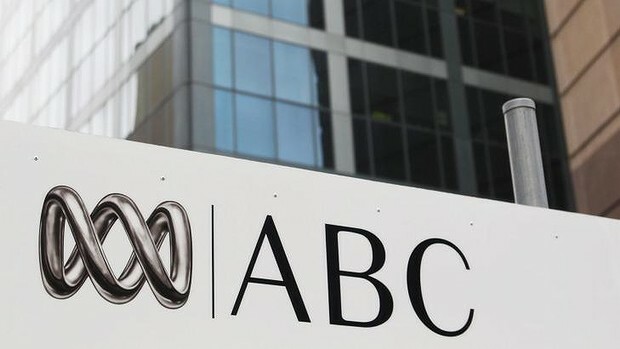 An ABC spokesman said the marketing budget fluctuated significantly each year, falling 6 per cent in 2012-13 and plunging 18 per cent in 2011-12. He said increase in advertising in the past financial year, often on digital platforms, ensured audiences found the ABC’s “strong, distinctive, Australian content”. “Where possible, we leverage our existing audiences on our own platforms, but like all corporations, we also need to find new audiences to keep evolving and growing,” the spokesman said. About $60 million worth of “back office” savings were identified at the ABC in an efficiency report, which Mr Turnbull commissioned earlier this year. Mr Turnbull wrote in a blog last month that the government’s cuts to the broadcaster would not threaten programming. “The savings sought from the ABC are not of a scale that will require reductions in program expenditure,” Mr Turnbull wrote. “The ABC may choose to cut programming rather than tackle back-office and administrative costs – but that’s the ABC’s call. But ABC managing director Mark Scott – whose reportable remuneration rose from $805,392 a year to $823,613 – says there is no “magic formula” for cutting costs without affecting content. And the board, headed by James Spigelman, was adamant that the ABC “provides value for money to the Australian community”. “The full suite of services—radio, television and digital, both domestic and international—costs roughly $120 per household per year,” the board noted in its annual report. For many, it’s because they want to grow and deepen the relationship they have with customers, whether that’s by reducing churn or increasing metrics such as average spend or purchase frequency. For others, there’s a recognition that loyalty programmes are a treasure-trove of data that can mined, manipulated and used to influence customer behaviour. This is more than just about semantics and language. It goes to the heart of what drives customer engagement. Because many of those business objectives can be achieved without a loyalty programme. The reason for asking ‘why’ is very simple: evidence, and lots of it, suggests loyalty schemes don’t always work. For sure, firms like Qantas, Woolworths, American Express, and Myers have all built highly successful rewards programmes. A combination of their size, frequency of engagement and in the case of Qantas the presence of a broad collation partners, have all helped them succeed. But it seems that by and large they buck the trend. According to Directivity and Citrus, less than 50% of people feel more loyal to a brand because it’s loyalty programme. Worse still, the same research suggests that less than a quarter see value in their membership. It’s easy to dismiss such discouraging numbers as small survey size (it isn’t, by the way) or because it reflects what people say they do in research v what they actually do real-life. Yet a recent McKinsey study of 50 leading US and European firms with a loyalty program showed the financial truth behind these responses. Weighted average revenue growth was the same or slower than those without. More tellingly, the cost of implementing, managing and fulfilling a loyalty programme saw EBITDA on average 10% lower than firms without. And that can be caused by any number of reasons. For example, over-investing in the value of rewards, effectively miscalculating the margin-share with customers; or the cost of carrying any redemption exposure onto the balance sheet. It can also be because rewards, when not driven by data, tend to be a relatively blunt tool for changing customer behaviour. Invariably those motivated enough to use them were already predisposed to choose the brand and as such the rewards recognised existing behaviour – therefore eroding value – rather than rewarding new or different behaviours. If the aim is to create a database that can be regularly mailed offers, incentives and messages, then so be it. It’s effectively a warm mailing-file for driving footfall. But that comes at a cost and most certainly isn’t the same as building an effective and engaging loyalty programme. Nor is it fully using the rich behvaiour insights locked in a customer’s individual behaviour. In truth, customer loyalty and engagement is a complex business. Even the simple act of rewarding customers can take multiple forms: points, discounts, cashback etc. And that’s before you consider the optimum delivery mechanic, mobile, coupons, plastic card etc. Let alone the much more complex challenge of aligning (often multiple) sources of customer data to transactional sources at a customer level. Because without that closed-feedback-loop, there’s limited opportunity to accurately show how the reward directly impacted sales and therefore ROI. Ultimately, it’s hard to imagine a customer feeling loyal to a brand with poor customer service or poor product performance. Recognising your customer, understanding their needs and serving them as an individual can be a far more effective way of showing you care, than simply giving away cash. Done poorly, it’s the corporate equivalent buying somebody’s friendship. Hardly the basis for a long-term relationship. Be sticky – offering ideas that simplify and make customers’ lives easier are often valued and often help make the relationship harder to break. For example, the simple introduction of Direct Debits, makes it harder for a customer to switch providers. Be social – we’ve always talked to our friends and neighbours about our experiences, it’s a natural human behaviour to share. Social media now amplifies the reach and impact of those conversations. Enabling people to engage to share their experiences can greatly increase their value to the brand. Whilst providing experiences – e.g. jumping the queue; shop the sale the day before the masses – are elements that can be incorporated into a broader marketing plan. Be valuable – rewards, discounts, cashback etc, whatever form they take, incentives remain an important tool for rewarding specific behaviours. The trick is to balance the economic cost with the value created through a measurable change in behaviour. No doubt, loyalty programmes work for some companies. And for sure, there’s a role for rewards as part of a concerted and coordinated programme of customer engagement. But in isolation, or as the primary tool for driving customer engagement, it’s questionable just how much value they will genuinely create. So next time somebody says: we need to build a loyalty programme, ask yourself why? Have we done everything possible to engage with our customers and are we ready to make the most from the data insights it will create. Home clubs sponsored by betting agencies can still show their commercials in their allocated scoreboard time. The MCG will remove gambling advertising from its scoreboard next season following the personal intervention of AFL chairman Mike Fitzpatrick. The contentious replay highlights branded by the international online betting company bet365 incurred Fitzpatrick’s wrath and saw him call for that company’s removal from the scoreboard. Fitzpatrick communicated his dislike earlier this season for the flash advertising to both his CEO, Gillon McLachlan, and Melbourne Cricket Club chief Stephen Gough. 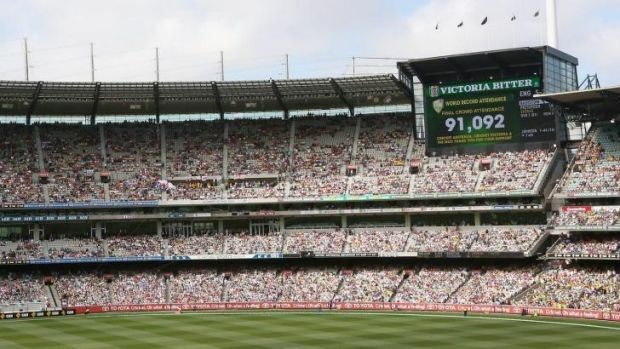 It has been a bone of contention with the AFL for some time that it does not control the scoreboard at its biggest stadium, which is leased by the MCG to Stadia Media. Gough told Fairfax Media on Wednesday that the advertising would not appear again in 2015 but that his stadium had to honour its agreement with the betting company and Stadia Media that expires at the end of this season. With the AFL attempting to improve its relationship with the MCG – despite recent tension over the stadium’s state government-led decision to stage international soccer next winter over two home-and-away rounds – Gough and McLachlan have held a series of talks over how best to revamp to the scoreboard. While the bet365 flash promotions, which run for one quarter of every MCG game, have angered Fitzpatrick, who supported the removal of live odds from AFL scoreboards several years ago, home clubs sponsored by betting agencies can still show their commercials in their allocated scoreboard time. The MCG banned live odds shown on its scoreboard in 2011 and the AFL followed suit at Etihad Stadium. More recently the AFL has come under fire from community leaders for trialling live games online in a rewards deal for TAB customers. The online game trial comes with the AFL expected to reach a lucrative new gambling partnership with the four-year exclusive Tabcorp deal due to finish at the end of October. It has been reported by Fairfax Media that the AFL could expand its front-line deal, with William Hill Australia and Matt Tripp’s BetEasy both in the frame. McLachlan refused to comment on the AFL’s strategy for its next gambling partnerships or whether the strategy was to expand the partnerships. Bet365 is a British-based online betting group which has come under scrutiny in the UK for political donations made by company directors, which have been linked to the relaxing of gambling laws in that country. The Queensland government will consider its options for penalising advertisers who fail to follow regulations. The Queensland government has decided the advertising industry is doing enough to regulate itself, but has left itself the option of coming in with a bigger stick if advertisers don’t abide by the regulator’s rulings. 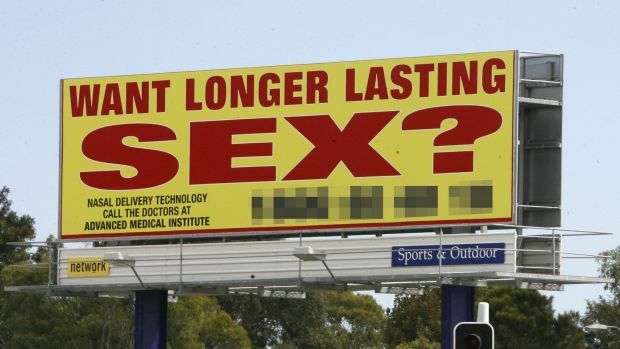 In response to a parliamentary inquiry into sexually explicit outdoor advertising that recommend the creation of a co-regulatory approach to outdoor advertising, the government has opted to act as back up to the industry’s self-regulatory approach. “The Queensland government will investigate enforcement options to penalise advertisers that do not comply with the determinations of the Advertising Standards Board,” the government tabled in response to the recommendation. It has disappointed Katter MP Shane Knuth who had attempted to change the laws surrounding outdoor advertising. “The reality is that community expectations are clearly in favour of governments stepping in and making advertisers clean up their act,” he said. The Australian Christian Lobby welcomed the government’s move to enforce any penalty, but hoped the government would go further. “The Advertising Standards Board is a self-regulated body. Currently, they alone hand down rulings against its advertisers and there is no recourse once their decision is made, making it difficult to keep advertisers accountable to the community,” ACL Queensland director Wendy Francis said. But CEO of the Outdoor Media Association, Charmaine Moldrich, said self-regulation was working. While Ms Moldrich was yet to read through the government’s recommendations or discuss it with colleagues or industry counterparts, she said the government’s message sounded consistent with the OMA’s argument at the parliamentary inquiry. “I think you have to look at the data and what the data is saying is we have a very good self regulatory system,” she said. “It is not about the number of complaints – complaints are a good sign that the system is working, that people feel empowered to act. “I think the proof in the pudding is always in the eating, and if you look at the number of complaints that have been upheld for outdoor advertising, for our members, it came down to one ad last year. Ms Moldrich said OMA went above and beyond to ensure that community expectations regarding outdoor advertising were respected. “We operate with 12 self regulatory codes in place which we don’t just abide by but we also educate our members on the codes,” she said. “Every 18 months we run a training program for our members with the AANA and the ASB to get our members across these codes. “We have made a real commitment not just to sign off on the codes, but to have a really meaningful relationship with those codes. That is to ensure our members are across them and understand them. “On top of those codes we also have the OMA’s own code of ethics as well as additional guidelines which we have put in place, for example, [with] alcohol advertising we have a 100 metre placement policy for schools. This responds to community concerns about such advertising.